Jennifer Wang was born and grew up in Pingtung, a small town in southern Taiwan, while her passion and talent for music have opened her up to the world. Shining at violin playing since she was five, Ms. Wang is now a violinist with a truly wide breadth. From classic music to christian worship music, all the way to contemporary work and improvisation. She earned her bachelor degree in Taipei University of Education, and is now studying with violinist Lynn Chang at Boston University. She has played with many world-renowned musicians, including Yo-Yo Ma, Yu-Chien Tseng, Keng-Yuen Tseng , and conductor Michael Stern and Bramwell Tovey. As a multi-faceted musician, Ms. Wang is also a songwriter. One of her famous songs is The Movement of the Youth, which now has over one thousand views on YouTube. Learning music has been the precious blessing to Ms. Wang. While growing up in a remote area, she had experienced being looked down by city kids or even teachers. Yet luckily, music has brought passionate, noble and beautiful human beings to her life, teaching her that talents can be developed, and no child should be given up. Many wonderful music teachers have left significant influences on Ms. Wang, and she is now determined to be the great leader, just as her amazing teachers, to introduce the music world to her students. In the August of 2018, she received the Suzuki training of ECC and violin book 1. Ms. Wang started receiving professional music education at an early age, and earned her bachelor of music degree from National Taipei University of Education(NTUE). She is currently a second year Master’s student at Boston University. Ms. Wang started shining at violin playing as a student. She was selected twice as a finalist in the national competition for music students in Taiwan. She won the first prize of the annual concerto competition at National Taipei University of Education (NTUE) in 2016, and played Korngold’s violin concerto with the symphony orchestra. She performed in many well-known venues all over the world, including Boston Symphony Hall, Stanford University, National Concert Hall in Taiwan and Xinhai Concert Hall in China. 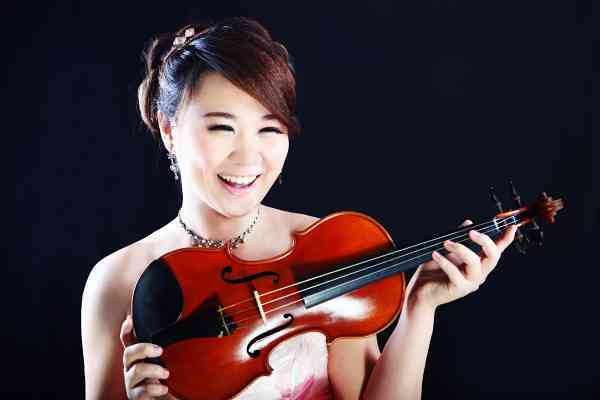 Aside from her outstanding performance on solo violin, Ms. Wang is also a well-known chamber musician. Her repertoire range is wide, from Haydn’s string quartets to Andrew Norman’s violin octet, Gran Turismo. In 2016, she won the first prize of the annual chamber music competition at NTUE, and performed Mendelssohn’s string octet. Ms. Wang performed in a masterclass for Li-Wei Qin, and has been coached by Phillip Ying (Ying Quartet), cellists Ya-Wen Hsueh and Victor Coo. In 2017, she played chamber music with violinist Keng-Yuen Tseng in a summer festival held by National Taiwan Symphony Orchestra. Ms. Wang has numerous experiences of orchestra playing. She joined Taipei Philharmonic Youth Orchestra in 2014, and in 2016, they were invited to perform in the Nanjing Forest Music Festival. Ms. Wang has also performed in many professional orchestras, including Tainan Symphony Orchestra under Hui-Min Tu, Taiwan Neo-Classical Philharmonic Orchestra under Chin-Lan Haung, Taipei Symphony Orchestra Chamber Orchestra under Gilbert Varga. In 2017, she joined the inaugural Youth Music Culture Guangdong(YMCG) Orchestra, where she worked closely with Yo-Yo Ma, Michael Stern, and the Silk Road Ensemble on a tour to Taiwan and Hong Kong. She served as principal of violin section in NTUE. In 2015, she got selected to play in the Bowdoin International Festival Symphony Orchestra. Other than the classical music repertoire, Ms. Wang also plays multiple genres of music. In 2017, she studied improvising with the Grammy award winning Silk Road Ensemble. She has played many contemporary music world premieres, including The Gate of The Hell and Falling leaves by Te-Wei Haung. Ms. Wang has accompanied talent shows in Taiwan and recorded in several sessions including the project Ah Gau & Her Friends. Ms. Wang has attended several International Music Festivals. In 2013, she went to the Walnut Hill Music Festival in Massachusetts, receiving violin lessons with James Buswell, Nicholas Kitchen, and Nai-Yuan Hu, along with a masterclass by Donald Wilerstein. In 2015, she went to Bowdoin Music Festival in Maine and studied in Renee Jolles’s studio. In 2017, she joined the YMCG under Yo-Yo Ma and Michael Stern. In 2018, she joined the inaugural Harvard Music Festival. Ms. Wang is also a songwriter and dancer. In 2013, she composed a song, The Movement of Youth, for her high school graduation ceremony. In 2017, she wrote a song Her Story. Owing to her passion for musical theatre, she has studied Broadway tap dance and Jazz dance. She has also received conducting lessons from the Artistic Director of Chicago Sinfonietta, Mei-Ann Chen in 2017. Other than music, Ms. Wang is multi-faced in many fields. She has won prizes in many speech competitions in junior and high school, which built her ability to talk convincingly and fascinatingly in public. She has been learning calligraphy since she was thirteen, and has earned many prizes in calligraphy contests in Taiwan. Also, based on an interest in Marketing, she minored in Cultural and Creative Industries Management. In 2012, Ms. Wang received Zonta Scholarship Award from Zonta Kaohsiung Club and Kaohsiung Yu‐Hsiuan Club. This award is for young girls who show great concerns for society and who have great international views. Later in 2017, she received a scholarship from music educator, Ou Kang.